Are we instucting our hitters and pitchers to do the same thing (ground balls)? Ron asked: I hear so many pitching coaches teaching their pitchers to keep the ball down to get more ground balls. My question is: If ground balls are what pitchers prefer, why should hitters intentionally hit them? Also, with the ball coming in on a downward angle, is the batter who was slightly under the ball, which produced a fly ball, closer to a line drive than the batter who clearly caught the top half of the ball? I'm confused. I feel like the same coach that tells his pitchers to get ground balls, turns around and tells his hitters to hit ground balls. Please help me understand this philosophy. Thanks. Rick answered: Ron, thank you for the question. It does sound like a mixed message. From a hitting perspective, I believe it is more of a team offensive concept than an individual hitting technique. The more pressure an offense is able to put on a defense, the better the chances are for the defense to make a mistake. The team that can play catch the longest generally wins, at all levels. The majority of fly balls are caught for outs. Aside from a strike out, a pop fly or fly ball are the easiest and highest percentage of recorded outs. 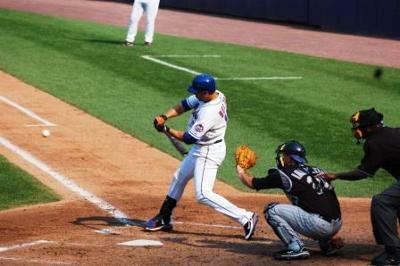 With a ground ball, someone has to catch it, make and accurate throw, and a catch has to be made at the other end to record the out. Three opportunities for something to go wrong. Putting the ball in play and making your opponent play the game makes things happen. In 2007 we were in the State Final game, two outs in the bottom of the 10th. We were up by 1, they had runners on second and third. Our pitcher got what we wanted, a two hop ground ball to our second baseman, our best infielder the entire season. We were all coming over the top step of the dugout in celebration as the second hop landed on the dirt, hitting something and going straight up and over the left shoulder of our second baseman. Both runs score, game over. We feel hitters thinking line drive tend to have a quicker, shorter path to the ball. Ground balls become a by product of this approach. We aren't looking to hit ground balls; but would rather miss the line drive with them instead of fly balls and pop flys, for the reasons above. No science involved here, just feelings and observations over the years. Thanks again. This question may generate some responses. That would be great.